I’m currently taking some heavy duty pain meds for a bad foot, and it makes me a little loopy sometimes. Whoever came up with this toy was on something way stronger. This is exactly what it looks like. 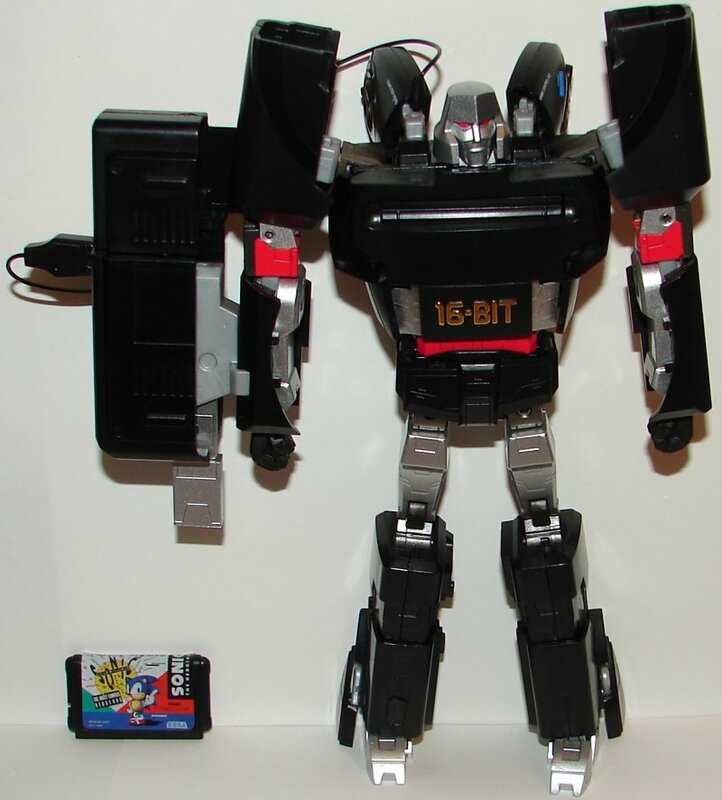 It’s a Sega Genesis (known as a Mega Drive in Japan) that transforms into Megatron. Yeah, I don’t get it either. At least it makes more sense that the Sports Label transforming sneakers. First off, at $120 I was expecting a much larger toy. 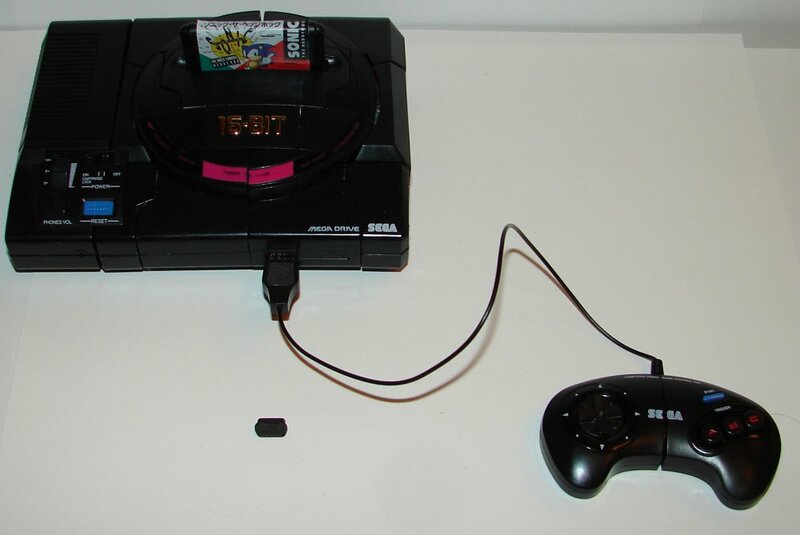 Not necessarily the full size of an actual Sega Genesis, but decent in size. This thing is tiny. In game system mode it’s only 4 to 5 inches wide (I’m estimating, I didn’t actually measure it, and don’t have it in front of me). In Game System mode it has a fake game you can put in the slot. The small piece in the photo is a cover for the port that the controller plugs into. Even with the plug in the ports don’t look the same. Kind of half assed. His transformation is kind of ridiculous. The way his arms and legs fold up are completely counterintuitive, and it constantly feels like it’s going to break. 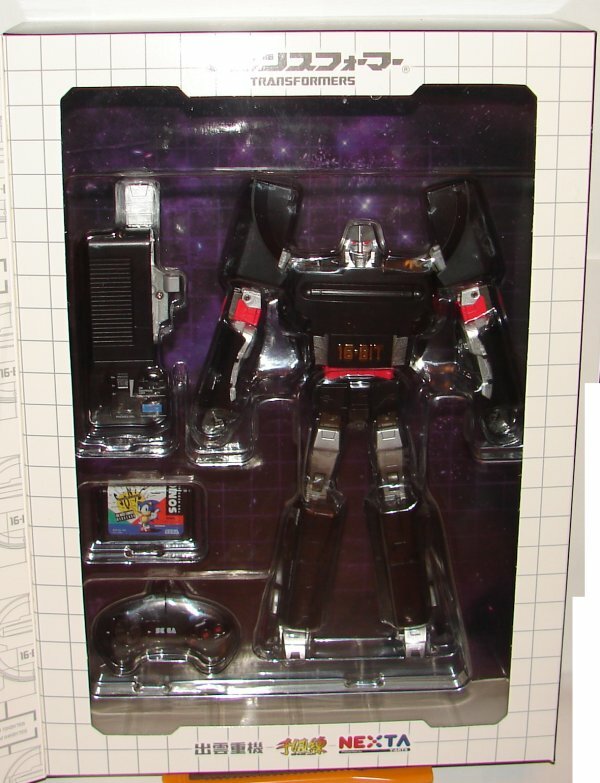 The left side of the console becomes his gun in robot mode. The controller splits and forms the sort of wings he has on his back. The cable from the controller connects to his gun, sort of like shockwave’s cable from his backpack to his gun. His feet are tiny, and although you can elongate them, they are still too small to make him stand up easily. He’s way too top heavy. Robot mode is overall not bad looking. He would have looked much better in all silver. 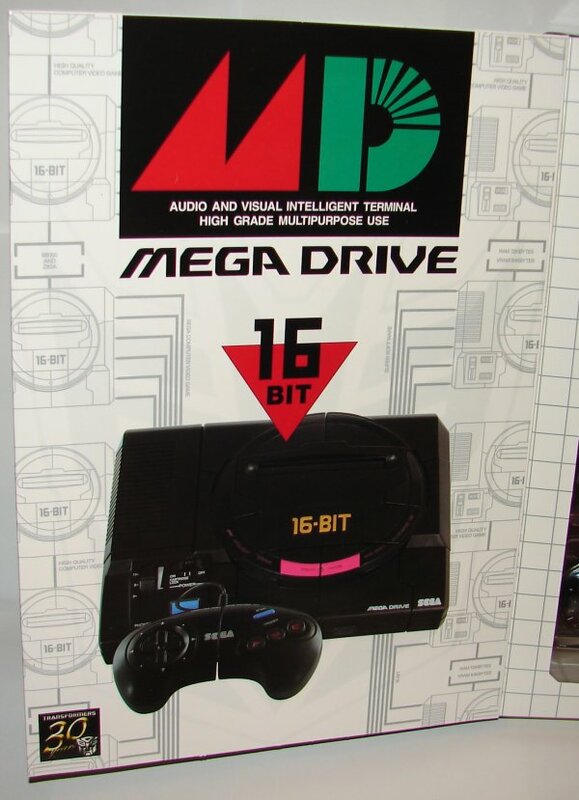 Had they billed it as a special edition Mega Drive in silver, they could have done this. Overall: At this insane price, I have to say skip it. If you’re a completist, you can probably wait for clearance. This is not going to sell out anytime soon. 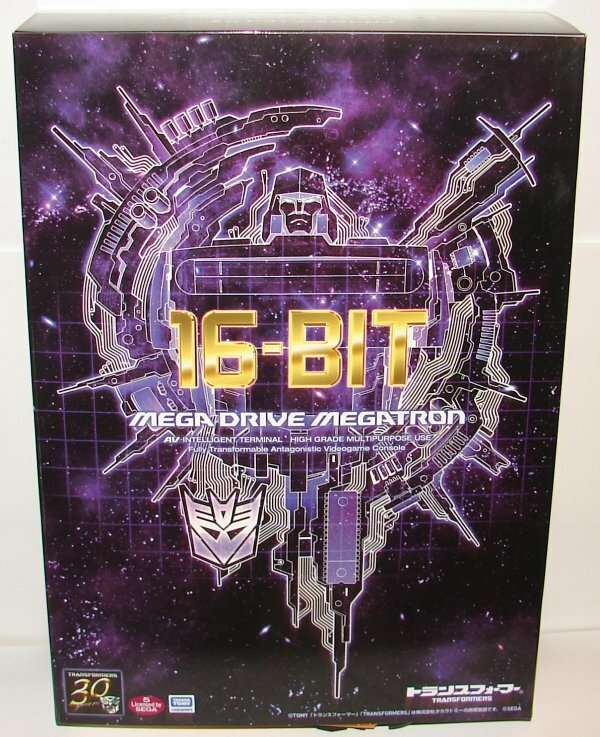 This entry was posted in Toy Reviews, Toys, Transformers and tagged 16-Bit, Mega Drive, Megadrive, Megadrive Megatron, Megatron, Sega, Sega Genesis, Sega Mega Drive, Sega Megadrive, Toys, Transformers, WTF. Bookmark the permalink. There were a couple of okay One Step Changers, the ones that used Drift’s flip transformation. BUt agreed, most of them weren’t great at all. The One Steps were Meh to me. $120 was the preorder price I saw. Honeslty, I think $75 is still too much. Agreed, the shoes didn’t make anymore sense than this. 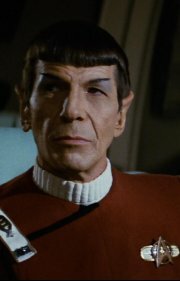 It is different, I will grant you that. Too bad the AOE line was fille dout with so much crap. A number of the Generations toys are quite good, but they get drowned out by One Step Changers and Power Battlers. Well first off the $120 price is slightly inflated. I preordered mine for the low price of $75. I’d consider him voyager size so I don’t think he is tiny at all. As for does it make sense? Well it makes no more sense than a transforming Nike shoe or a New Era baseball cap! With video games being my other big hobby, especially retro games, this release and the upcoming Sony PlayStation Optimus are right up my alley. Sometimes I feel its appropriate to take a break from the mainstream TF series, especially the crap called Age of Existence!